Relieves pain and muscle spasm. Increases flexibility and range of motion in joints. Increases strength and tolerance to exercise. Provides relaxation and relief from stress. The healing properties of hydrotherapy are based on its mechanical and/or thermal effects. It makes use of the body’s reaction to hot and cold stimuli, to the protracted application of heat, to the pressure exerted by the water, and to the sensation of the water itself. Nerves carry what is felt by the skin deeper into the body, where it is then vital in stimulating the immune system, influencing the production of stress hormones, improving circulation and digestion, encouraging the flow of blood, and lessening the body’s sensitivity to pain. Should the water temperature hot or cold? Generally speaking, heat is used to quiet and soothe the body, and to slow down the activity of internal organs. Cold is used to stimulate and invigorate, increasing internal activity within the body. If you are experiencing tense muscles or anxiety, heat is recommended in the shower or bath. For feeling tired and stressed out, it is recommended to take a warm shower or bath followed by a short cold shower to help stimulate the body and mind. Do I need to put my head underwater? Most treatment sessions and classes do not require you to put your head under at all. Sometimes the physiotherapist will do exercise or treatment techniques that mean the back of your hair might get a little wet but if you do not wish this to happen you can tell the physiotherapist or wear a bathing cap. Can I wear my glasses in the pool? Yes, since most treatment sessions and classes do not require you to swim or put your head under at all. Occasionally your glasses might get splashed but we have towels handy to wipe them. Sometimes you will be required to read the list of exercises that the physiotherapist has designed for you so your glasses may be required. What do I wear to the pool? We ask people to wear pool-suitable clothing; this can include commercial swim wear or gym wear. Heavy fabrics (such as cotton t-shirts) absorb water and become heavy, lighter weight polyesters tend not to absorb so much water. Boardies (surf shorts) and a rashie (surf top) are easily found and suitable for the pool. On your first session any swimwear, gym-wear or light-weight shorts and top would be fine. We can discuss with you other options after you have experienced your first session. If you are worried about what to wear one of our very experienced staff members is happy to speak to you over the phone. Being in pain, certain surgeries or being over-weight can all make the idea of swimwear less than pleasant but we have ways to make this easier for you. Do you need to be able to swim to do hydrotherapy? Being able to swim is not essential when doing hydrotherapy. Initially the physio will be with you, and in fact, depending on your condition swimming may not be the best thing to do. As you progress there are several possibilities. These may include group or class opportunities, buddy situations, independent exercise or other possibilities. Depending on your condition, water confidence and swimming ability we will discuss the best option for you. Can I get a health fund rebate or is there any funding to help cover the costs? Fees are generally payable at time of treatment. Private health fund rebates can be claimed from most health funds for Physiotherapy, Aquatic Physiotherapy, Hydrotherapy. We have the facility to process most claims at the time of payment. We accept DVA, Third Party and Workcover patients, with appropriate approval or paperwork. Third Party and Workcover patients are responsible for payment of their accounts should funding cease. Medicare rebates for Physiotherapy, Aquatic Physiotherapy services are available for patients with chronic conditions and complex care needs on referral from their GP. Through Medicare (EPC/Teamcare/Chronic Disease Management) and with appropriate paperwork you may be eligible for partial funding for up to 5 sessions with a physiotherapist in a calendar year (dated from your first session). We do not bulk bill, so there will be a gap payment. Ask you GP or speak to us for more information. Is Hydrotherapy effective for sore muscles and pain? Hydrotherapy can reduces muscle tension and relieves pain. The weightlessness you feel when under water relieves tension in the limbs, supporting aching muscles and easing the movement as opposed to when on land. Plus, hydrotherapy stimulates the release of endorphins, acting as a natural pain reliever which will further reduce muscle soreness. 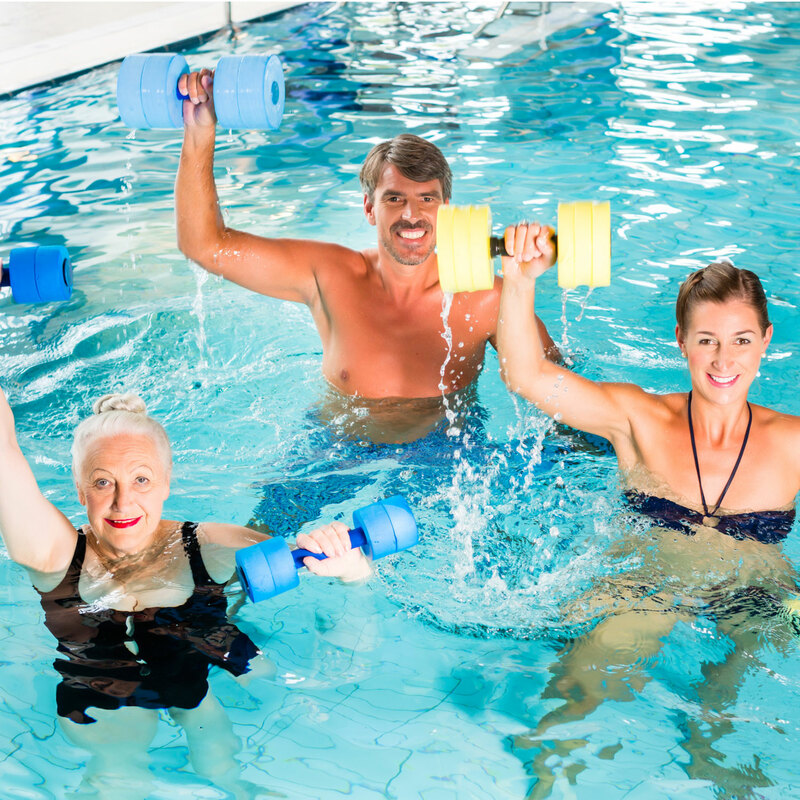 How does Hydrotherapy rehabilitate injured muscles? Being immersed in warm or hot water raises the body temperature, increasing blood flow around the circulatory system and so alleviating pain. The improved circulation will in turn help to heal injured tissues and rehabilitate damaged muscles or joints. Does Hydrotherapy boost the immune system? The increased blood flow and circulation of white blood cells around the body allows lymph (an immune system fluid that helps collect and get rid of unwanted materials from the body) to be moved through the body more efficiently and therefore strengthens the immune system, helping to fight colds and illnesses. Hydrotherapy treatment can be effectively used whilst to aide stress relief. Hydrotherapy can help to reduce blood pressure caused by stress. It may also slow down the body’s reaction to anxiety and release endorphins – a natural stress fighter.